It's was the catch to the DWS 100 uniforms. It was what we hoped would go last year, but instead it only got bigger. It was the black eye of MSU's football uniforms. But it is no more. The oversized M-State pants logo has been removed for the 2016 season, and replaced with stripes. The first sign of the impending change was that the 2015 game pants were being worn in practice throughout the fall. Still, it seemed too good to be true. As late as yesterday, I gave the oversized logo a 70% chance of return. Boy am I glad to be wrong. While the helmet and jersey (with black outlines) from 2015 will remain the same, the white pants have taken some influence from the gray pants that were introduced last season. The new pants feature a maroon-gray-maroon stripe down the side and a (much) smaller M-State logo on the left front. This differs from the gray pants, where the M-State logo is on top of the stripe on the left side. Maybe they've also altered those to be more consistent. But given how inconsistent this set is already, I wouldn't count on it. While I have proposed ditching all accent colors and going strictly maroon and white, the introduction of these pants seems to propose that gray is the accent color going forward. So the simple solution at this point would be to replace the black outlines on the jerseys with gray ones. There's honestly no reason they couldn't have done this before last season when they switched to the Primeknit template. It'll be interesting to see what maroon versions of these pants look like, as well as if the gray pants have been altered any. Other uniform changes for the 2016 season could be helmet related; the big question is if the white helmets from last season will return. The Nov. 5th game vs Texas A&M is scheduled to be a blackout. I would bet on the black jerseys from last season returning for that game, but maybe not the pants. In other football aesthetic - related news this week, the field design for the 2016 season will feature the M-State logo at midfield for the first time since 2012, and the first time ever for this exact version. 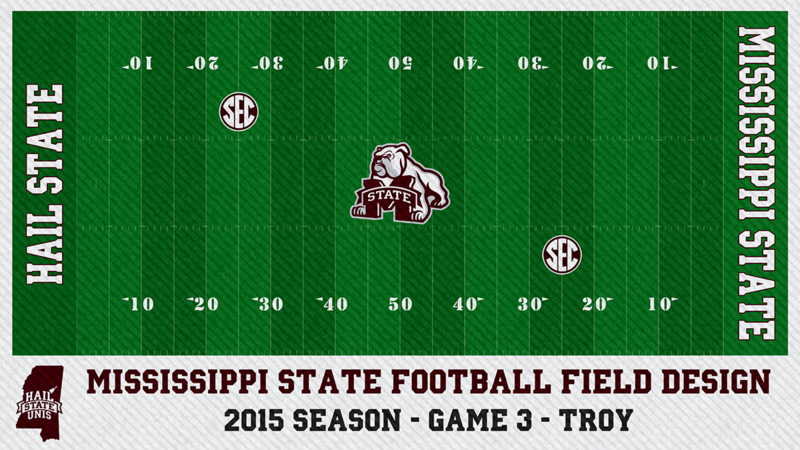 Last year, the standing bulldog logo was featured at midfield. The 2016 Season begins Saturday morning as the Bulldogs take on South Alabama wearing the shiny maroon helmet, maroon jersey, and new white pants. Kickoff is at 11:00 a.m.